You’ve likely heard it before in discussions with friends, coworkers or family – social media fatigue. From long-winded political rants to unending comment debates between strangers, social media has become a place for everyone to have a soapbox and vent their day-to-day frustrations. Some argue that it has become a place of negativity. Since the creation of sites like Facebook, the world has become a much smaller place, and it has connected many people who otherwise may not have ever seen or spoken to each other again. This was the case for Jack, a former resident of SVdP’s transitional shelter Ozanam Manor. Jack grew up in Arizona with his parents and six siblings. He was close with his siblings and has many happy memories of their childhood together. As a child, he picked up odd jobs around town to make some money, such as painting houses, mowing lawns and doing a paper route. Sadly, when Jack was 9 years old, he became the victim of abuse from a neighbor and this event ultimately changed the trajectory of his life. Like many children who have gone through a traumatic experience, Jack began to act out in school and fight other children who were bullying him. At age 12, he entered juvenile detention. When he was released at age 18, he committed armed robbery and was convicted for 10 years at a state penitentiary. After serving 10 years and in his late twenties, Jack had trouble assimilating back into society and ended up returning to prison for another incident. For many years, prison was the only life Jack knew. He escaped multiple times, but was always caught and returned. Because of his escape attempts and some incidents against other inmates, Jack was frequently transferred throughout the years to different prisons, including a short stint at Supermax in Colorado. “I’ve been in prison all of my life. I don’t know how I made it through, but I did. It hurts me now when I think back on the things I’ve done,” he says. Early on, Jack lost contact with his family, as he was transferred from place to place. He thought he would never see his family again. About one year ago, at age 57, Jack was finally released and free for the first time in many years. “When I got out of prison I was scared to death,” he says. He didn’t know how to find a job, much less fill out an application. He didn’t know how to find a place to live. 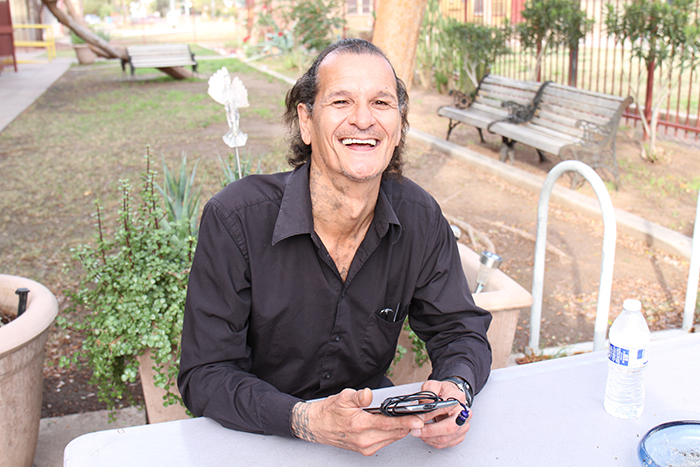 Unfortunately, like many former convicts without a support system, Jack ended up living on the streets in Phoenix after leaving a halfway house. 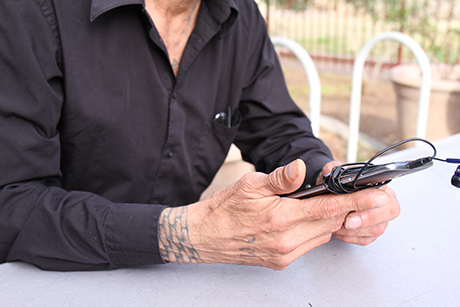 He caught pneumonia three times and was close to death when someone from the halfway house referred him to SVdP’s temporary shelter. Arizona State University intern and Oz Manor caseworker, Kim Speed, was assigned to work with Jack. Kim helped him get his medical prescriptions, helped him with medical and financial appointments, and even looked into his insurance coverage to find out if he could afford to see a behavioral therapist. But most importantly, Kim listened. When he said he had tried before with no luck, she went onto Facebook to search again. As luck would have it, she found Jack’s older brother and immediately reached out to him through Facebook’s messaging app. “It was the first time that I saw a real smile on his face,” she said, referring to the first time she showed Jack his brother’s photo online. Jack’s three siblings, who now live in Colorado, were more than excited to hear from him. His sister told him they had been looking for him all those years and in the worst moments, feared he had died. According to Jack, when he called his sister for the first time, she screamed his name several times because she was so shocked and happy to hear his voice. All three siblings quickly worked to find an apartment, job and transportation for Jack and told him they wanted him to come home. Kim took the extra step to really listen to Jack and help him in an unconventional way – a way that ultimately led to him leaving homelessness behind and start a new life with his loved ones. “I just felt like he needed that support and help. I can be resourceful when it comes to those things. It’s why I went into social work – to help people like Jack,” she says.